Fabulous single females over 50 find fun and friendship while navigating the strange world of online dating and the men who inhabit it. It's the time of year for our annual Thanksgiving ritual, a time to remember and share something special we gained or learned or experienced this year. Something that has changed us, made us more appreciative of our lives, something we recognize as a blessing. So we enjoyed a spirited time over potluck dinner, lots of sharing and laughing. It was a smaller than usual group, which seemed to allow us to be more real, more open, and more vulnerable. This surely carried over to our time of describing the one thing we gained this year. These are the ladies' revelations, to finish the sentence, "This year, I am grateful....."
choose to come tonight to be with all of you even though I'm catching a cold. * that my grandson in the military is in the States and has not been sent anywhere. theater arts class which makes my heart feel good, that I am able to memorize and perform plays. * that since I have to continue to work, I am able to do it. opportunity, and that I appreciate more and more what life brings me. can walk at a clip. and that my son is getting married this year. I am getting things done and I can sleep and I am not pressuring myself. * that I don't have to settle and that I went to Niagara Falls, one of the last things on my bucket list. It's obvious that we didn't express our pleasure at having a new car or taking a European vacation or having a new boyfriend. We all expressed our gratitude at having the things in life that are priceless, things that feed the soul, things that make our life richer in a meaningful way. I'll add to the list, as I write this, that I am grateful for the friendship of such amazing women. Ah, dating. When we were young, did we ever imagine that we’d be dating in our 50s and 60s? 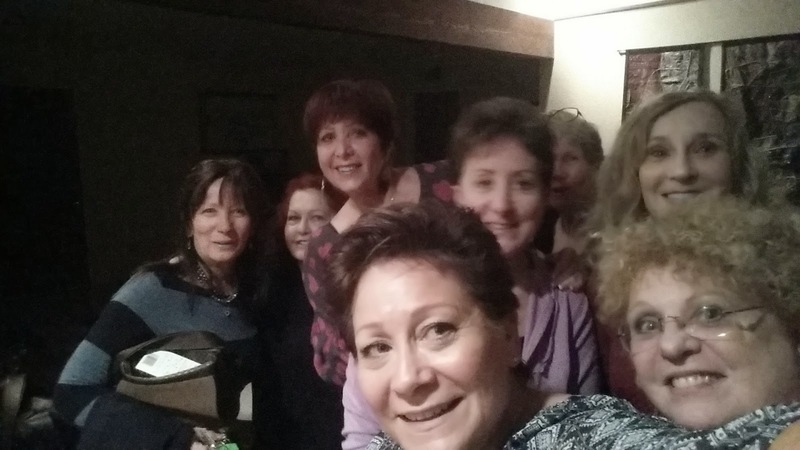 Lucky Wowettes, we had the honor of meeting Dr. Sue Mandel, the speaker at our recent meeting, who specializes in dating over 50, with groups and seminars and private coaching, and dinner with us! Sue said that we need a plan for success, starting with making outward improvements, such as make-overs, losing weight, getting fit. And then on to taking a look inside to our baggage (yes, everyone has some!). Do we have issues with intimacy and trust that would hinder a healthy relationship? Do we think we should play games with those we date, such as waiting a certain amount of time to return calls? Do we try too hard to become what the other might want us to be, losing ourselves in the process? Do we end up with someone we choose or who we want? She reminded us about something so simple yet so easy to forget – flirting! To Sue, it’s a way to engage others, a playful stance that uplifts, a way to be engaged in the moment, and, surprise, can be learned! Sue teaches flirting! She reminded us that flirting, not just at the beginning of a relationship, increases the physical and emotional health of a relationship. Did I mention that she teaches flirting? Ah, the dreaded coffee date! That first meeting, so full of hope and worry. Sue teaches that it’s a time to assess our dates, but reminds us that we often are so intent on making the guy like us that we often miss out on a valuable time to get to know who is this guy we are meeting, what are his values, does he respect his mother, does he talk bitterly or pleasantly about past loves, does he have friends, is he stable financially and emotionally, is he a gentleman. Love, love, love that Sue shared some personal stories of her past dating experiences, yikes how we can all relate! But she does suggest that, unless there is a definite red flag raised during our meeting, it might be valuable to give the guy a second date, just to make sure if he might be a good fit. And how well she knows us daters! That we come home after a first meeting, while we wait to see if he will call again, and worry if we did or said something that he didn’t like or did he find us his type and on and on. When really? We should be assessing him, whether he is what we want, whether he fits our list or not. and that I’m sure looking forward to attending her upcoming 8 week group meetings about this very subject. And I’ll leave you with the words she spoke that I’m not likely to ever forget, that rather than wondering if we’re good enough for that next guy, it’s time to re-connect with what is wonderful in us. We might be 50+, Dr. Sue reminds us, but we're at our best!